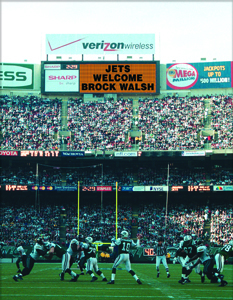 "When the New York Jets departed the Big Apple for the Garden State in 1984, they left behind a dilapidated stadium and second-class citizenship foisted upon them by the New York Mets. What did they get when they crossed the river from Queens to Manhattan to alight in East Rutherford, New Jersey? More seats, better parking, a better financial deal and second-class citizenship courtesy of the Stadium's prime tenants, the New York Giants. The Jets try to make the place homey by hanging green coverings and bunting over the (Giants') blue walls, but they failed a few years ago in an attempt to get the New Jersey Sports and Exposition Authority to rename the big cement dish. Jets fans never will be mistaken for hoity-toity folks attending the opera. They know the game, and make their displeasure known when all is not well. With the Jets, not having had a winning season since 1988, all has not been well in some time. And we're not just talking about boos and chants. At a Monday night game in 1988, with the home team badly trailing Buffalo, some fans set fire to their seats. By contrast, Giants fans seem positively genteel. Tickets have been in their families longer, and they're more respectful of neighboring patrons. Jets fans tend to be younger and, well, more boisterous. Win or lose, you can expect a hot time at the ballpark when the Jets play." January 14, 1999 (Reuters) - New York City Mayor Rudolph Giuliani on Thursday proposed a massive new sports complex on Manhattan's West Side, trying to lure a professional football team with a domed stadium, and urging Madison Square Garden to relocate next door. A far less ambitious plan for the site, a billion-dollar baseball stadium for the World Champion New York Yankees, has already sparked fierce community opposition because of cost, traffic and environmental considerations. But far from conceding to such criticism, the mayor, a possible presidential contender in 2000, expanded his blueprint. Giuliani's new plan, in addition to a football stadium and a basketball and ice hockey arena for the New York Knicks and the New York Rangers, would expand the city's Jacob Javits Convention Center and extend a subway line from Times Square to the complex. The Republican mayor, who smilingly declined to elaborate on any national ambitions during his sixth annual State of the City address at City Hall, listed the new complex as one of the monuments he wanted his administration to leave behind. Giuliani did not rule out the earlier plan to use the site for the Yankees, who have yet to decide whether to stay in their historic Bronx stadium. Indeed, he said that option must be kept open in order to negotiate effectively. The mayor did not name a specific football team, but his mention of "Super Bowl champions'' was seen as a reference to the New York Jets, who face the Denver Broncos on Sunday in the AFC division title game. The winner will advance to the Super Bowl on January 31, 1999. 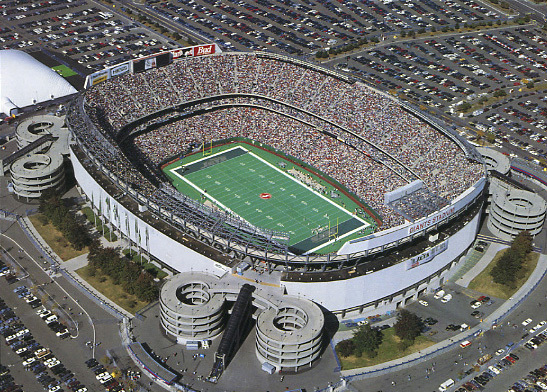 The Jets, despite keeping New York in their name, in the mid-1980s moved from Queens to the Meadowlands sports complex in East Rutherford, N.J. The New York Giants play in East Rutherford as well. Whitman, also a Republican, has bashed Giuliani's plan to ship garbage to two transfer sites in her state. Howard Rubenstein, a spokesman for Yankee owner George Steinbrenner, made it clear that any decision will depend at least in part on how much aid is granted. "He (Steinbrenner) still has the opportunity of going to th West Side. If the White House and state and city get together and pump a great deal of money in the Bronx, he still has that proposal,'' Rubinstein said. Giuliani said the Yankees and the Mets, who want a new baseball stadium in Queens, would both have to help pay for their new homes. So would the city, the state, and the private sector. The mayor, a baseball aficionado, said he also was a football fan, but that economics was one of his main motivations. "This is the way you do economic development,'' Giuliani said, pointing to the jobs that would be created and the real estate development such a huge project would spur. Civic and community groups, some of whom successfully blocked earlier plans to expand the West Side highway, could pose the most serious obstacle to Giuliani's ambitions. 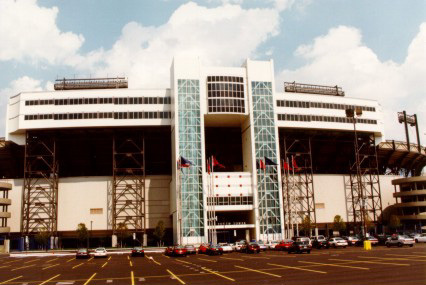 September 17, 2000 - Giants Stadium in the New Jersey Meadowlands complex is a typical 70s football stadium, and now serves as the home of the Giants, Jets, and the MLS Metrostars. Getting to the stadium is easy, as the complex is served by numerous expressways and the traffic pattern is somewhat easy to navigate. Parking is abundant and tailgating is evident everywhere, except that the Meadowlands is pretty much built in the middle of a swamp so the ambience of this venue is not the greatest.